The “Shot in the Park” has been juried and is ready to go! Opening night will be May 4 during Friday Night Liberty. 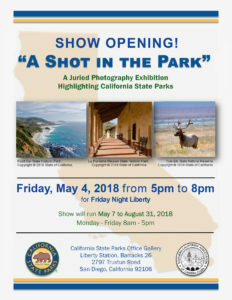 Photographs will be on display May 4 – August 31, 2018 in Liberty Station. This show has been sponsored in part by SCACC.